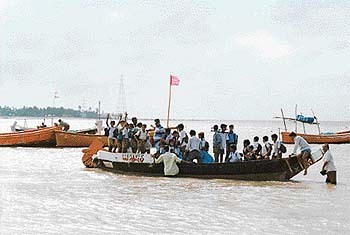 THE villager had reached the boat. Standing waist-deep in the sea, he threw his trousers on board and turned around to persuade me one last time. "Chaddi pehna hai na?" he shouted. Women looked up from their work and giggled. 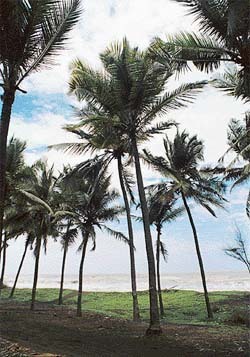 I beat a hasty retreat through the village gullies and returned to Arnala beach! 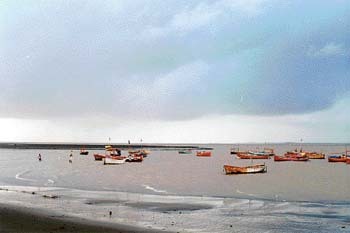 Arnala is one of the many quiet, green fishing villages around Mumbai. What makes it special is the 'Janjire Arnala' or island fort, just 10 minutes away by motorboat. Nine kilometres from Mumbai's Virar station. It takes 50 minutes and Rs 10 to get to Virar from Andheri by train. Both buses and Minidor rickshaws charge Rs 7 from Virar to Arnala. The Minidors are more comfortable. The boat trip from Arnala to the island takes 10 minutes and just Rs 4 for a round trip. So I had four hours to kill on Arnala beach. I began by taking in the scenery. The brown sea was splashing noisily on my right. On my left, coconut and palm groves stretched as far as I could see. A band of boys had assembled in a clearing, midway along the path. They were armed with drums and trumpets and a number of other instruments I hadn't seen since school. I spent some time just hanging around, listening to the boys. Once they became accustomed to my presence, I started shooting. After that, I played with and took pictures of a baby. At the end of all that shooting, I still had two hours to kill. Lunch seemed like a good way to kill time so I had missal-pav and Amul ice cream in the marketplace. After that, I went down to the sea to wait for the ferry. The boat arrived at a quarter past four and stood in knee-deep water (they don't come in any closer). About 30 others got in with me, with wares ranging from cloth to fish. The boat felt big and secure while anchored but, once on the sea, it rose and fell quite a bit. I kept up a brave face and congratulated myself repeatedly on my first-ever 'maritime experience'. The voyage lasted all of 10 minutes! The fort stands on the island's northern shore and its main gate is also in the north. Boys were playing cricket on the shingly beach before the entrance. The Arnala fort is built on a roughly 200X200 metre plan but, despite the small size, it had immense strategic importance. It was built by the Muslim rulers of Gujarat and later captured by the Portuguese, who used it to control shipping and navigation along the western coast. Since the fort was located on an island, it was not easy to capture. The Marathas learnt this the hard way during the three-year Bassein campaign: The Arnala fort stood in the way of a naval campaign against Bassein. The Marathas therefore decided to capture it first. In 1737, a Maratha naval force attacked the island but was routed. Finally, the Marathas took the fort in a surprise attack on March 28, 1737. 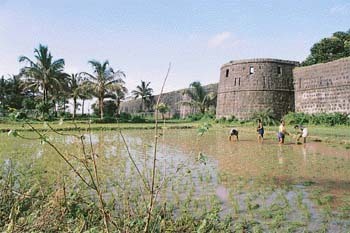 The fort remained with the Marathas from 1737 to 1817. In between, they had to surrender it to the British but got it back under a treaty. They again lost it to the British under the treaty of Pune. Even today, the walls of this fort stand strong. However, the inner buildings are all gone. The villagers use the inside of the fort to raise vegetables, and the outside for paddy! The steps leading up to the ramparts have survived the centuries and it is possible to walk over the entire wall, taking in the sea, the hills on the mainland and the trees on the island itself. Scouting around and shooting the fort took me almost two hours, which was all the time I had as the last ferry leaves at 6:30 pm.As the ferry splashed on towards the mainland, I firmly clasped its sides and sat smug as a sailor freshly returned from a conquest!